This week, I had a chance to talk with Cisco about the new Unified Computing System (UCS) architecture. For me, this was an opportunity to get a deep dive into the architecture and understand what may not be obvious initially. First of all, the UCS is most beneficial to the largest environments. There can be scenarios where mid-size environments make sense, but there are many factors. Generally speaking, the UCS framework makes financial sense in the 2-to 3-blade chassis range. This is based on port costs for the blade chassis of the competition plus actual switching and interface costs on the blades. This is where it gets interesting. The costs for traditional blades can get high for 10 GB Ethernet switches and Fibre Channel switches to accommodate the I/O for blade chassis. In the case of UCS, this I/O is consolidated to a component called the UCS 6100 Fabric Interconnect (you can see it here). The component is the hub for all communication in the UCS realm. Here, blades are connected to the Interconnect with a Fabric Extender that resides on the blades. While the Interconnect is relatively expensive, the Fabric Extenders are around $2,000 each (list price). 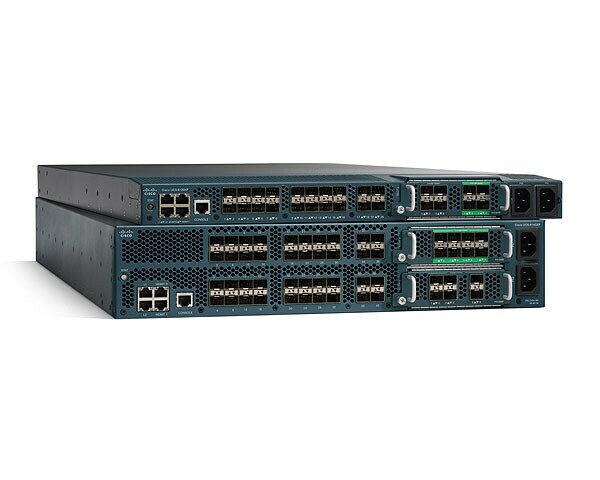 The Fabric Interconnect is available with 20 or 40 ports that can accommodate 10 or 20 UCS blade chassis, respectively. The Fabric Extender is the incremental cost in this configuration. Compared to traditional blade architecture, this is the main benefit and is cost recovered in the 2- to 3-blade chassis range. The UCS is a high-featured framework, but not without limitations. One thing we cannot do is connect a general-purpose server (non-UCS server) directly to the Fabric Interconnect. The Interconnect is not a single switch (even though it might look like one in the image), but a conduit of all network and storage I/O. So, if I wanted to put a 1U server (not like any of us have one-offs!) in the same rack as a UCS blade, it would need its own cabling. The UCS platform is also a framework, meaning that other vendors could make blade servers to go into the Cisco chassis and take advantage of the service profile management stack. Partners have expresses interest, though none are currently doing this. The service profile provision process manages everything from MAC addresses for Ethernet interfaces, worldwide names for storage adapters and boot order to the servers. This management stack and provisioning tool is included with the platform for no additional cost. For many virtualization administrators, we have not yet transitioned to blades for one reason or another. The UCS platform will soon offer a rack-mount server with the forthcoming C-Series. Where does this fit into your virtual plan? Hardware platform selection is one of the more passionate topics that most virtualization administrators hold. Share your thoughts below on the UCS framework and how you view it.